That really is a question! Before we go any further, this is ‘just’ a writing blog. Nothing about the dogs, no recipes, nothing about gardening, no sunset…okay maybe some sunset pictures. Mainly I’m going to muse about writing. Although, yeah, I do have some interesting garden developments. 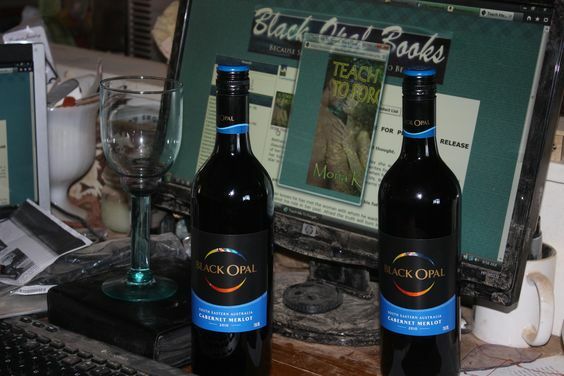 Private launch party: the Internet and some Black Opal Wine! full length veil attested to the purity of the bride, leaving no doubt in the mind of anyone attending that day that this was, indeed, a virgin bride. The diaphanous covering enhanced her bridal outfit, personally designed by the hand of the dresser of royalty. Brilliant fire opals had been meticulously applied to the hand sewn, French cut white bikini. The fire opals were a suggestion of friend who was a college librarian and an inveterate reader. I’d originally chosen seed pearls which she insisted were far too mundane. I’m sure she was right! This is from Teach Me To Forget, a non-hyphenated Romance. No Suspense, no Fantasy. Just male-female meeting, realizing they have a fairly difficult history, and choosing to move forward together. There’s a sequel…isn’t there always…set in New Mexico. Actually mostly written. Which I’ll get to work on after this most recent Stormhaven story. So what were we talking about? Oh, yeah, prologues. In the case of TMTF, the prologue worked, introducing two people who would meet again later. There is, of course, a wedding at the end of the book that is not nearly so sophisticated. In A Question of Trust, which I’m editing, I started with a prologue, and had a blast writing the first chapter. Unfortunately this chapter was all about the characters from the first two Stormhaven books. Not good if I want to write about new and different people. Cut that chapter, and move on. I might share it…anyone interested? So I’m asking readers, before I get on with edits: Prologue? No Prologue? What works best for you? Next, I’ll get back to gardening. I have guests coming from a long long way and I really want the place to look good! Whichever one the book needs, says the smartass writer pal. Like you said, it works for some books, not for others. I was never a reader of prologues. I’d skip them and start on chapter one. Sometimes I discovered that I should have read the prologue – such as in SF writer Jack McDevitt’s books. He almost always writes a prologue, setting up (usually) what happened a long time ago, which the real story attempts to solve. They are often found in fantasy and SF, where the author uses a prologue to get the reader up to speed. That’s adding backstory which could be incorporated into the book, and I’ll have to say, I often thought McDevitt’s prologues were unnecessary. The day came when, after much navel gazing, I added a prologue (and an epilogue) to my historical fiction novel, the only prologue I have written for all my books. I thought long and hard before I did it, knowing full well I’m not the only one who doesn’t much like them. In this case I backed my judgement and went ahead. And that, I think, is the argument. Could your novel stand alone without the prologue? If the answer is ‘yes’, leave it out. If it’s ‘no’, then write a prologue. PS Yes, I have indeed committed prologue! I think for television it’s a cheap attempt to grab our attention…that usually works! For books, I agree it totally depends on the story. Taking it away from Teach Me To Forget IMO weakened the story because we start out with a brittle young woman who has trust issues and trying to explain those as I went along slowed things down. For this current book, the prologue added too much distance between story and reader. We’ll see! For A Question of Trust the prologue was a cheat. It took a LONG time to get that first chapter in order, but it really is setting up the book. Notice the positive spin! my thoughts on Grisham! In Teach Me To Forget the prologue was critical since it helped set up the book, which starts ten years later. I salted in the details of her wedding later on but I felt the story needed this. In A Question of Trust, I was stalled on edits until I realized the prologue needed to be the first chapter since it was here and now. And the first chapter needed to go away. THANKS for stopping by!